Conservative Party Resolution P-203 to strip the fanatical CHRC -- passes “nearly unanimously”! The first vote on P-203 was passed nearly unanimously. It now goes to the full convention tomorrow. 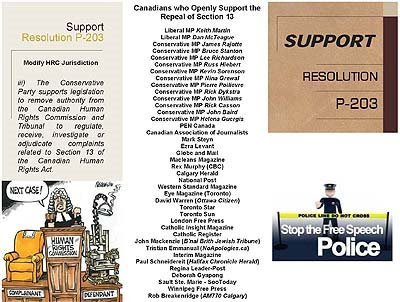 This is great news, and shows how powerful the “Support Resolution P-203” flyer was by informing delegates to the Conservative Policy Convention, just what a threat the fanatical Canadian Human Rights Commission really is. The flyer that made the difference! As noted in an update to the last post, word outside the security perimeter is that the proposal to strip the Canadian Human Rights Commission of the power to investigate Section 13 hate speech complaints passed “nearly unanimously”. FreeDomimion: Resolution P-203 Update !! !